I made this card today for my mother in law who's birthday is next month. Yeah I finally have a card done ahead of time. I just have to print/stamp a message on the inside, that's the easy part. I also have a card idea for my sister who is turning 13 but I have to order the stamp set this week (her birthday is July 6). Originally what I planned on doing was adhering the image then cutting the flowers on the pattern paper a little bit and then over lapping them over the image but it didn't look right at all. So instead I mounted the image onto SU Apricot Appeal Cardstock. I put small flower brads in the upper and lower corners. The pattern paper is from DCWV Once Upon A Time Castle Tapestry (I love this paper line). I was thinking about inking/chalking the edges of the image, not sure yet though. Oh so beautiful!! And that tapestry dp is just gorgeous!! I never can resist House Mousies!!! 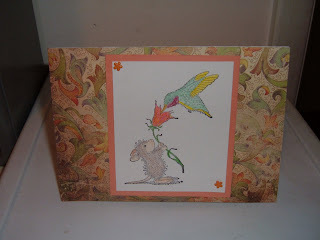 I love this card and the House Mouse image (they are so sweet)is absolutely gorgeous. MIL is very lucky. What a pretty card, Chrissy! I love the House Mouse stamp and the background paper is beautiful! I luv house of mouse stamps!